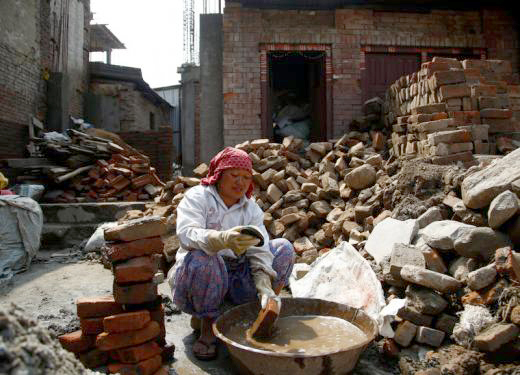 BANGKOK, April 27 : Two years after powerful twin earthquakes in Nepal killed thousands of people and displaced millions, the slow pace of reconstruction offers an opportunity for the Himalayan nation to change its economic model, which leans heavily on remittances from Nepali migrant workers abroad, labour rights groups say. Less than a fifth of destroyed homes have been rebuilt, according to media reports – a rate of progress that has attracted criticism. But this presents “a unique moment” for Nepal to create jobs that protect workers’ rights, pay fair wages and boost the economic status of its citizens, according to a new report by US-based groups Solidarity Center and JustJobs Network. A lack of employment opportunities – linked to years of political instability following a Maoist insurgency – pushed around half a million people from the South Asian nation of some 26.5 million to leave home in 2014 for low-paid, often risky work abroad, government figures show. “The disaster is a wake-up call,” said Gregory Randolph, executive vice president of JustJobs Network and the report’s lead author, referring to the quakes that hit Nepal in April and May 2015. “It is an opportunity for Nepal’s leaders to pivot from an unsustainable trajectory of dependence on labour migration toward domestic job creation and a more inclusive vision of economic growth,” he added. The report urges the government to invest in repairing and building infrastructure such as highways, irrigation and power systems to create direct employment, encourage foreign investment and facilitate trade networks. For example, agricultural products like cardamom, ginger and vegetables from quake-hit communities could be processed and packaged in the southern plains where a majority of migrants originate and border links with India make exports easy. The report also recommends setting up a portal to connect graduates of government training programmes in masonry, plumbing and electrics with employment on construction sites, including those where homes are being rebuilt after the quake disaster. In addition, disaster recovery centres for businesses could help incubate job-creating enterprises, and programmes launched that certify skills returning migrants have acquired abroad. 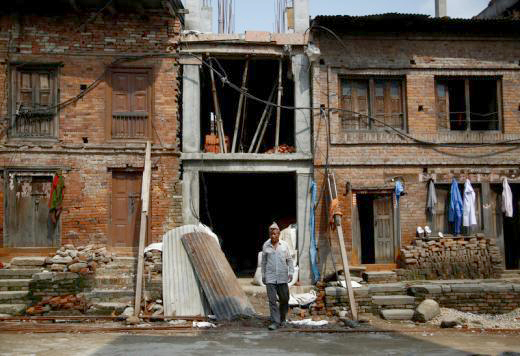 The report proposes that Nepal’s government negotiate with international aid donors to free up quake recovery funds for measures to stimulate the local economy. Nepal, home to Mount Everest, is one of the world’s poorest countries. Its economy relies on labour migration rather than jobs that keep its workers in the country, aid agencies said. Migration is not new for Nepal, but between 2008 and 2012, the government introduced legal reforms and regulations to make it safer and more formal, which appears to have stoked the recent wave of departures. Between 2008-09 and 2014-15, the number of annual registered migrants from Nepal more than doubled – to nearly half a million from fewer than 220,000, the report said. Remittances are now equivalent to 32.1 percent of the country’s GDP, up from 10.9 percent in 2004, it added. Migrants are mainly men who labour in manufacturing and construction, and increasingly women doing domestic work. For many, pay is low and some are subjected to physical abuse and forced labour, studies have shown. Malaysia is the top destination, closely followed by Gulf nations such as Qatar, Saudi Arabia and Kuwait, according to the International Labour Organization. “Today, every second household in the country has at least one family member working in a foreign country,” the report said. Aid workers say this has profound effects on family life. The 2015 earthquakes also caused migration inside Nepal. More than four out of five people displaced by the disaster in the 14 most-affected districts have moved to different villages, the United Nations said.